If you knew me when I was a young pup, in addition to finding me shy, you’d also consider me a great bad-gift-giver. One Christmas I gave my family (ahem, let’s be clear… MYSELF) the Activision Skiing video game (see the mind-numbing action here). Me aside, a Kiker family flop. 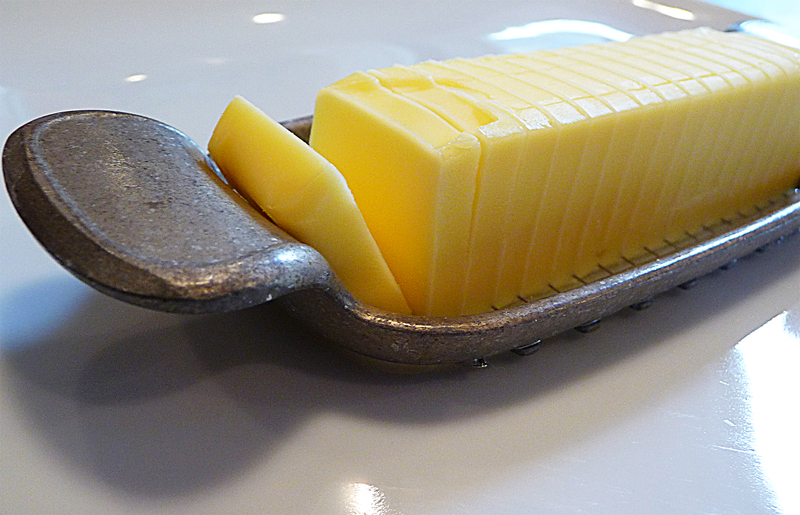 Probably the worst gift I gave anyone ever, was when I gave dad a butter slicer for his birthday. A butter slicer? What was I thinking. More importantly, what was dad thinking? I still have the butter slicer (at left) and while it sat dormant in my kitchen drawer during my college and early-adult years, it now makes a debut in my kitchen every week or two when perfect butter slices are a must. And perfect butter slices are always a must. I have to admit the butter slicer is really handy… especially for days like today when I whipped-up a batch of these savory and delicious corn fritters. I’ve heard of fritters, but reuniting with these gave me the good-time jitters… I loved them and watched my belly swell with pride as I popped these out of the skillet and into my mouth. 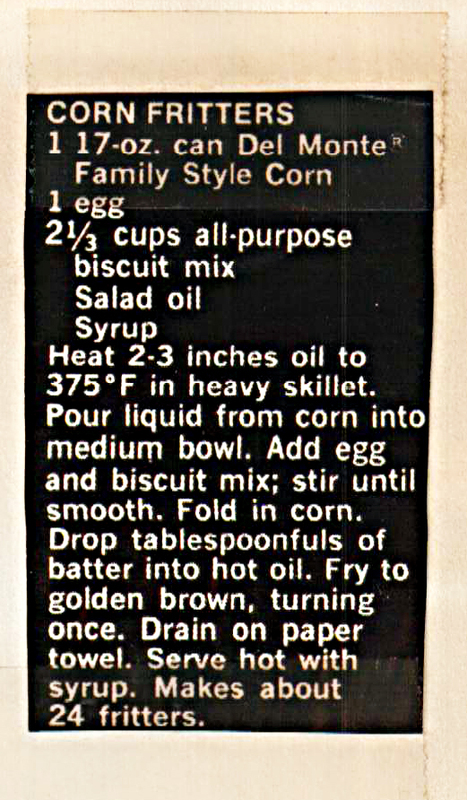 Thank goodness I found this recipe in mom’s cookbook. 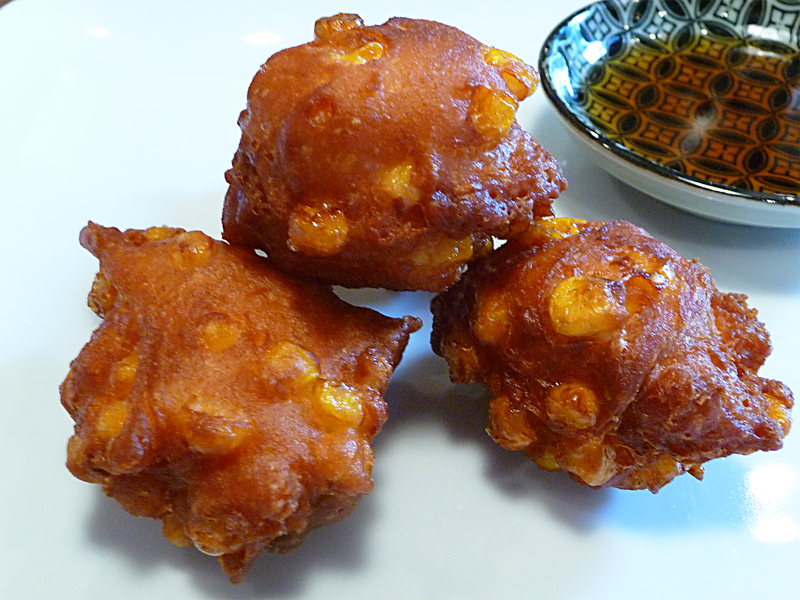 When was the last time you enjoyed a fritter? 1. Heat 2-3 inches of oil to 375°F in a heavy skillet. 2. Pour liquid from corn into medium-sized mixing bowl. 3. Add egg and biscuit mix; stir until smooth. Fold in corn. 4. Drop tablespoonfuls of batter into hot oil. Fry to golden brown, turning once. 6. Serve jitters hot with syrup and a slight brushing of butter. ♥ Salad oil is vegetable, canola, peanut, sunflower or the like. ♥ Serve with syrup + BUTTER = Yes! 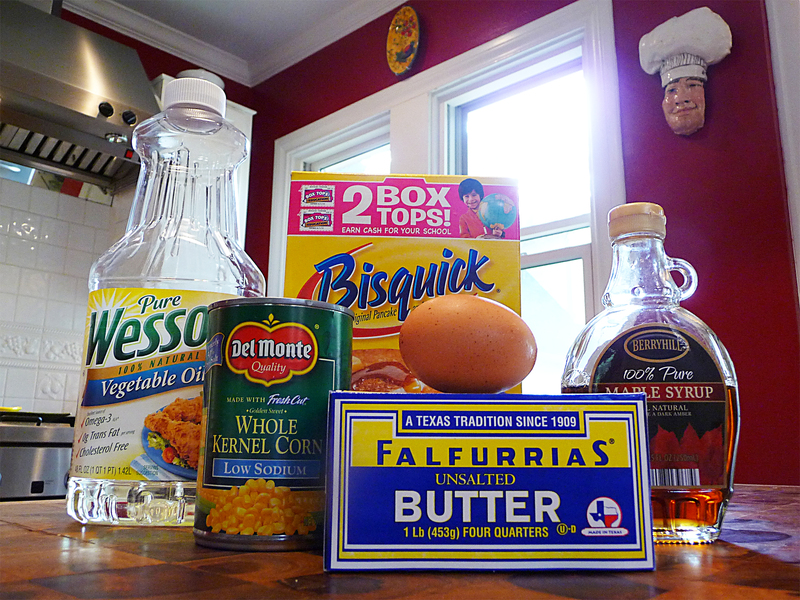 (remember to make it Falfurrias brand butter per Nanny). 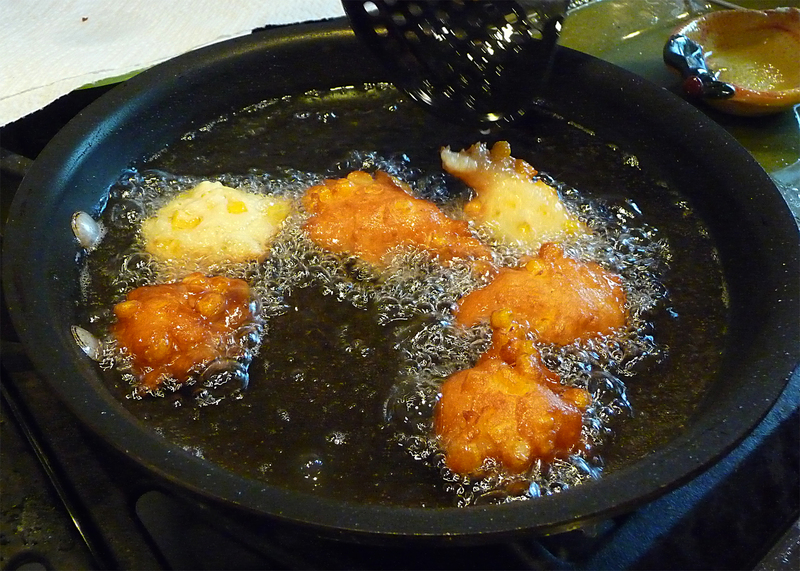 You can melt the butter and brush it atop the fritter just before dipping it in your favorite syrup. De-li-cious! 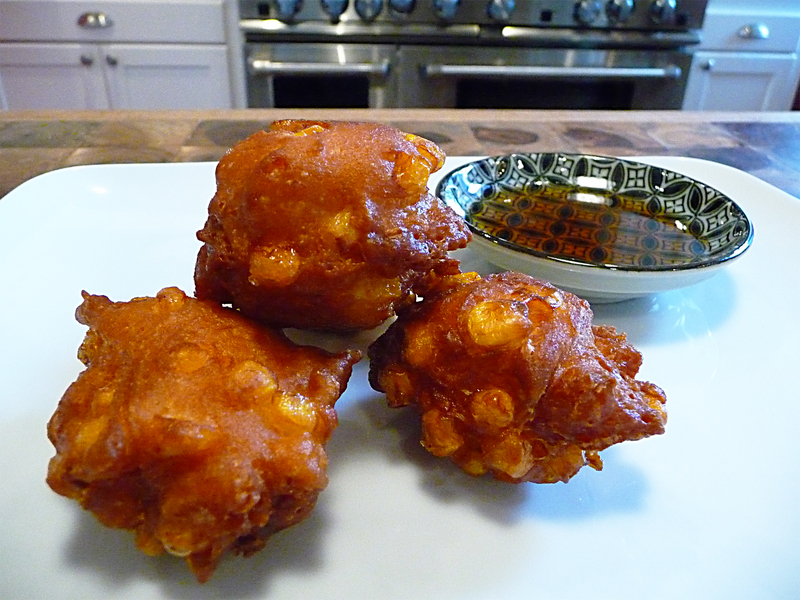 ♥ I haven’t tried this yet, but I bet the fritters are also great with a dusting of powdered sugar. ♥ A 17 ounce can of corn? They come in 15.25 ounce cans these days. Go figure.